After rolling out July security patch for Galaxy Note5 in India last week, Samsung is now rolling out August security update for the Galaxy S6 edge in the country. 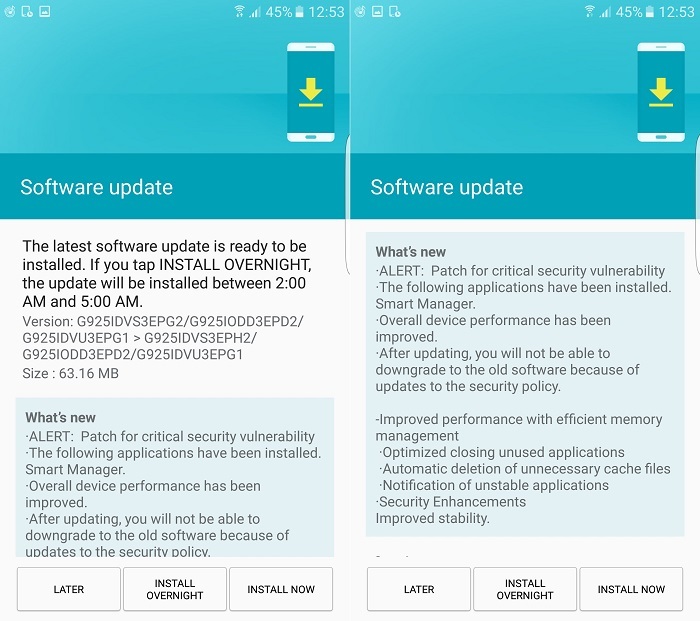 The security update doesn’t carry any of Android’s August security patch but comes with “patch for critical security vulnerability” which might be specific to the Galaxy S6 edge. The update also installs Smart Manager app on the device and comes with some performance improvements and optimizations. Even if the update patches a critical security vulnerability, it’s not clear whether it is for the recently discovered QuadRooter or for some other vulnerability. However, you shouldn’t be much worried about QuadRooter either as Google has already made it clear that Verify Apps feature present in all Android devices is enough to safeguard your Android device from the QuadRooter vulnerability. This August security update is 63.16 MB in size and changes the firmware version of the Galaxy S6 edge to G925IDVS3EPH2. If you notice any other changes apart from the ones mentioned in the changelog, do let us know.